We have added videos to some of our recipes to show you in more detail how we cook them. These videos are not edited or enhanced and most are the result of a single take. Apologies if they are amateur, but they are honest. A very simple recipe that was a great hit with the kids! It kept them occupied for about an hour. The best Chinese starter of all time. Take our word for it and give it a try!. One of the best recipes for using leftovers of mashed potato and cooked cabbage. One of our most popular recipes and it's easy to see why. It's a Spanish classic with very simple ingredients that produces and superbly tasty deep omelette. The simplicity of potato cakes combines perfectly with the delicate flavours of dill and smoked salmon. A deliciously flavoured meaty fish served simply with a lemon and parsley sauce. Prepared and cooked in under 15 minutes. A classic combination of chorizo with bags of flavour and the chickpeas which give the soup superb texture. 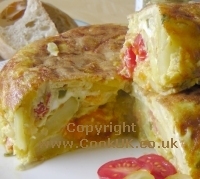 A colourful and very tasty version of the traditional Spanish Omelette. Forget the purists, if you treat the rice correctly then you can add what you want to a paella. We add king prawns and chorizo. We use kabanos Polish sausages (available in supermarkets) for this recipe but any good quality sausages can be substituted. Tasty soup with a great texture. A classic British dish which is delicious and easier to make than you think. The classic Gazpacho Soup recipe. Cool and refreshing on a summer's day. Using picante chorizo gives this stew a slightly spicy taste which is absorbed perfectly by the lentils. A delicious warming soup for a winter's evening meal. Restaurant top quality egg fried rice in less than fifteen minutes. Our video recipe shows us cooking a perfect poached egg in real time and in one take. Simple but delicious food.